Description: Large shrub 2–4 or rarely to 9 m high, usually with many spreading to ascending branches; younger branches with a loose, sometimes floccose indumentum. Leaves oblong-ovate to oblong-elliptic, 8–22 cm long, 2–8 cm wide; apex acute to mucronate; upper surface smooth, rich mid-green, sometimes shiny; lower surface with a close, thin indumentum, the reticulum evident through the hairs; margins sometimes slightly crisped; petiole usually 2.5–8 cm long. Inflorescence up to c. 30 cm long; lower order axes sometimes glabrescent, apical parts usually retaining a loose indumentum. Petals strongly reflexed, yellowish green. 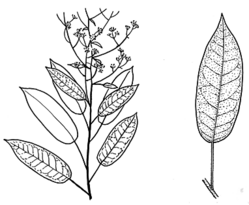 Distribution and occurrence: Grows in wet sclerophyll forest or rainforest margins from sea level to at least 1500 m alt., on a range of substrates including shale, quartzite, sandstone, and basalt; chiefly on the coast and ranges north from Narooma district.